Peter Strickland's Berberian Sound Studio didn't sit too well with us here at QE. Our UK correspondent thought it was stretched well beyond the point of enjoyment and I had a similar reaction when I saw the film later in the year. It's a great concept, that of a celebrated sound designer who travels to Italy to work on his first horror movie only to become consumed by the project. Soon Gilderoy (Toby Jones) starts to lose his mind and the line between reality and the movie he's working on begin to mix. 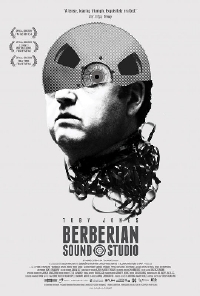 Though we didn't care much for it Berberian Sound Studio did play a solid festival run to quite a few positive reviews and though I can't whole heartedly recommend it, it does feature some pretty eerie moments and Jones' man losing his mind performance is very good. Berberian Sound Studio will land on VOD June 14.